Porcelain veneers are also known by many as traditional veneers. These veneers ideally started as temporary solutions that were used to improve the beauty of smiles in the 30s, but have gone on to be much more prominent. Porcelain veneers are thin ceramic shells that are bonded to the front side of your teeth. Due to their effectiveness, they have become permanent solutions that have helped people get rid of unwanted smiles. Porcelain veneers are also long-lasting; they can very well last up to a decade (however, if you keep them properly and have the right dentist, it is possible for you to have porcelain veneers for up to 20 years). When porcelain veneers are being applied, it is essential that an impression of your teeth is taken. 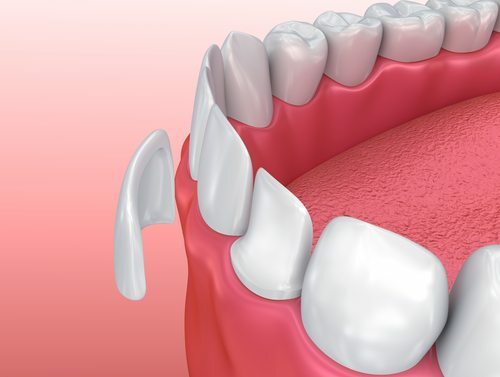 This will ensure that the veneers are able to perfectly fit the existing structure of your teeth. During this period temporary, veneers will be administered, and they will be subsequently replaced with the permanent ones. Once the porcelain veneers have been applied, you’ll be able to use them and transform your smile. However, there is a disadvantage to porcelain veneers in that while some are being applied, they will be too painful and will require some shots of anesthesia. These veneers are pretty strong but replacing them will be very tricky when they get chipped. The teeth beneath the veneers are also usually reshaped during the application of these veneers. As thick as a contact lens, lumineers are undoubtedly the thickest and strongest types of veneers. You don’t need and grinding to apply lumineers, and the process is relatively pain-free. Lumineers are able to last up to 20 years, and removing them is pretty easy (if desired). If you’re looking for a cheap and less destructive way to achieve that smile that you always wanted, then these are probably the veneers for you. They are able to last for about five years (a decade if you apply and take care of them well, though) and they are able to perform their job perfectly due to the composite material that will be covering your teeth. The material used to make palatal veneers is usually gold, but some can be made of other materials like porcelain as well. These tools are applied to the innermost part of your teeth, and they are used to treat and manage the wearing of the teeth. These veneers are usually used before you have your permanent porcelain veneers placed, or when you want to get them replaced with new ones. The material used in making them is either a flexible resin or plastic. They are easy to apply, and they usually don’t inflict any pain as well.